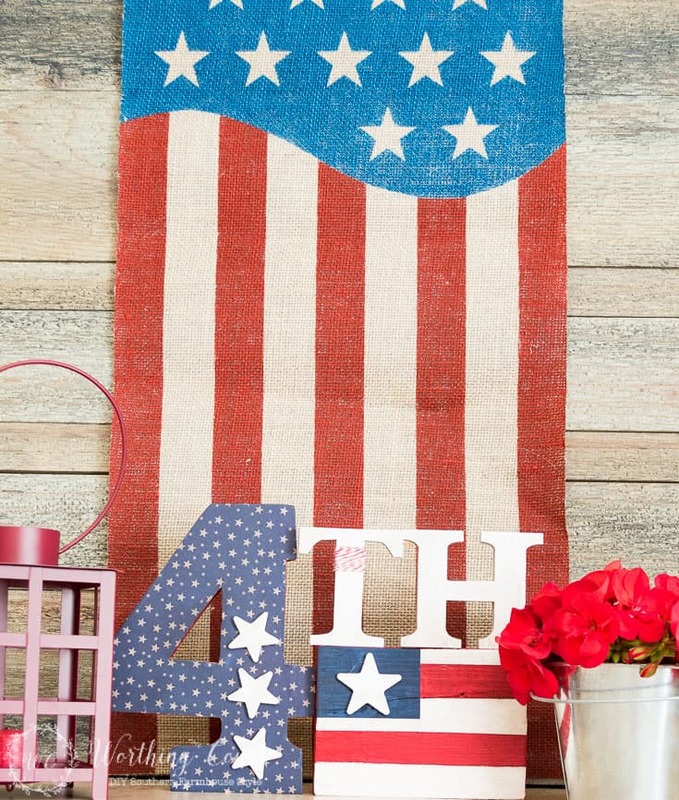 Time is flying by and we’re quickly approaching several patriotic holidays – Memorial Day, Flag Day and July 4th. 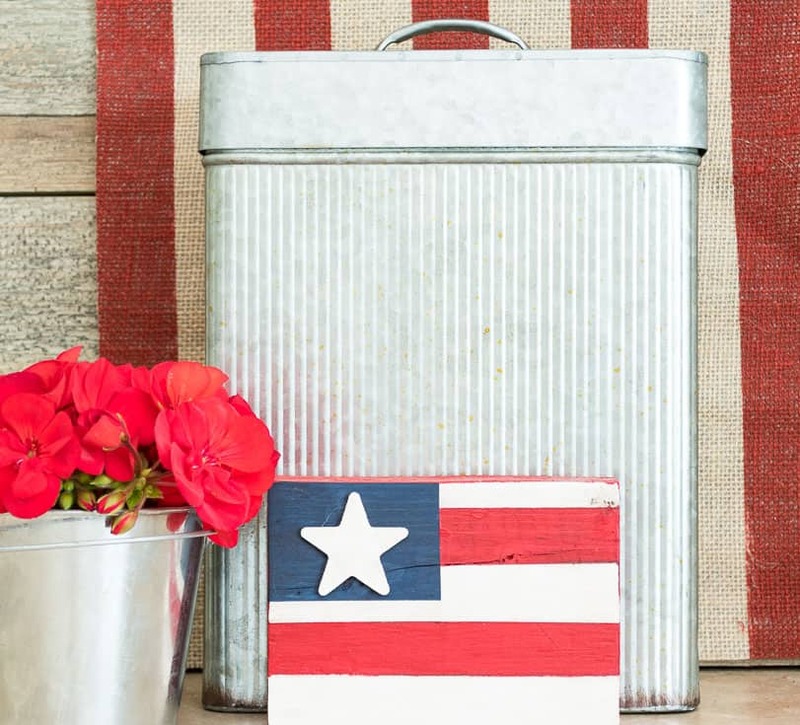 I have a get together planned at my house sometime before July 4th, so I want to deck my screen porch out in patriotic decor! I have several little projects that I’m doing and will be sharing along the way. First up is an easy and cute craft that will work for all three holidays. 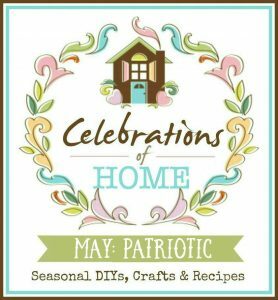 Before I go any further though, let me welcome you to this month’s Celebrations of Home party! This month my buds and I are bringing you all sorts of patriotic inspiration. Scroll down to the bottom for a link to everyone’s project. I first started this craft with the intention of using it at July 4th. But, when it came time to assemble it, I realized that I could make it work for any patriotic holiday. None of the display is glued together. I intentionally left them unattached so that I could display just the flag for Memorial Day and Flag Day. Glue Gun & Gluesticks – This one is on my wishlist! 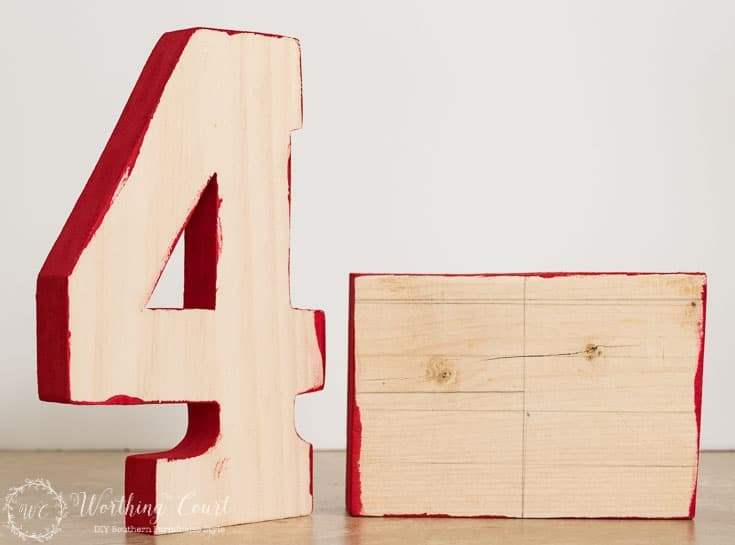 Step 1 – Cut a block of wood that is proportionate in size to the number 4 that you are using. My number 4 is 8″ tall and my block of wood is 4″ high x 5.75″ wide. Sand the edges. Step 2 – Using a pencil and a ruler, draw the stripes and the section for the star on the block of wood. Step 3 – Paint the edges of the number 4 and edges of the block of wood with red craft paint. It doesn’t matter if some gets onto the front as it will be covered up later. 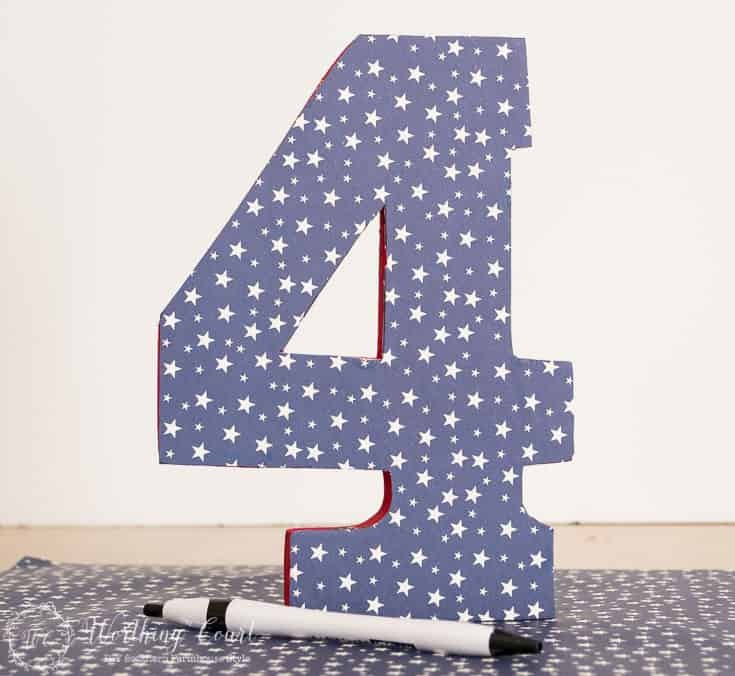 Step 5 – Lay the number 4 down onto the piece of star scrapbook paper. Trace around the number and cut it out. Line up the edges and glue the paper to the wood letter using Mod Podge. Allow it to dry. Step 6 – Using painter’s tape, paint the upper left corner with the blue paint and paint red and white stripes on the rest of the wood. Allow to dry in between colors. Step 7 – Using the ruler and stain pen, draw a line where each red and white stripe meet. This will cover up any slight imperfections of the lines and will also add depth. Allow the stain to dry. Step 8 – Paint the letters T and H and the stars white and allow to dry. 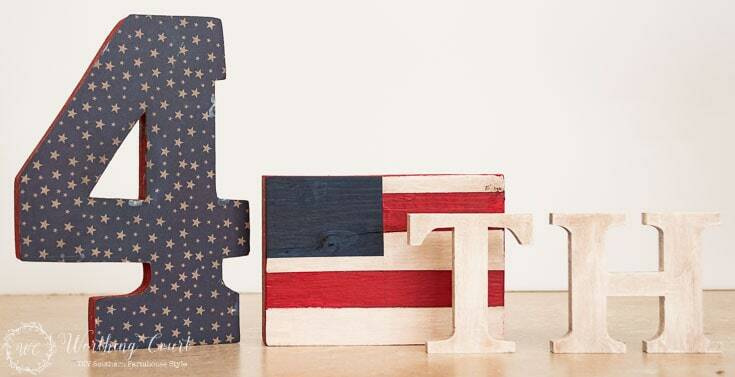 Once dry, use a rag to wipe stain onto every piece – the 4, the painted wood block, the T and H and the stars. Wipe most of the stain off, leaving just enough to give the pieces an aged appearance. Allow to dry. Step 9 – Wrap red and white baker’s twine around the upper part of the T, securing with little bits of hot glue on the back. 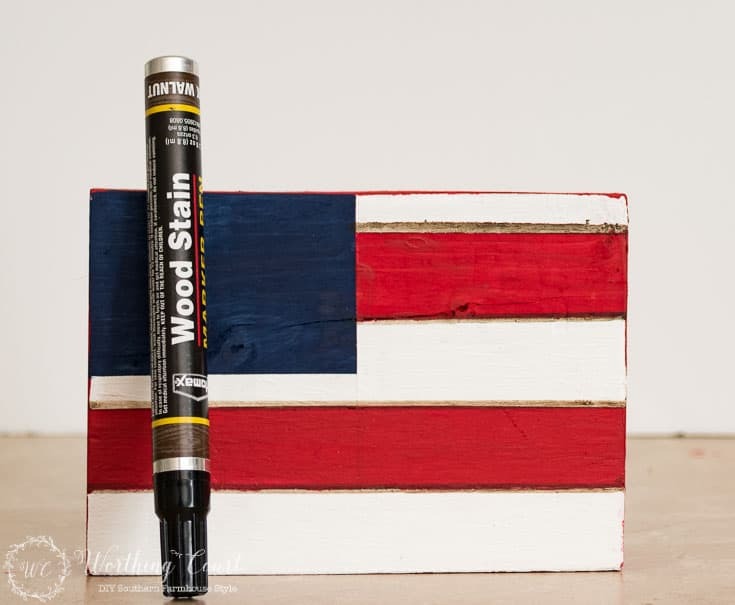 Glue the stars to the 4 and one star to the flag using the hot glue gun. You’re done! Now just stack your pieces as desired. Display just the flag for Memorial Day and Flag Day or the entire set for July 4th. Pssst! Have you entered my $100 Visa giftcard giveaway? All you need to do to enter is to leave a comment! Click HERE to enter. Such a cute idea and simple to do. So glad you like it Margaret! Hope you’ll give it a try. These are such fun and festive ideas. I bet your house looks so much fun right now. This will come in handy thank you! I love buying wooden cut outs, saws and I don’t play well together at all. I can totally relate, Sandra! How festive, Suzy! I love that you used such no fuss materials like wood from your stash and scrapbook paper to make each piece so special. Thanks so much for sharing your craft with us on #shinebloghop this week! We’re so happy you were able to join us! 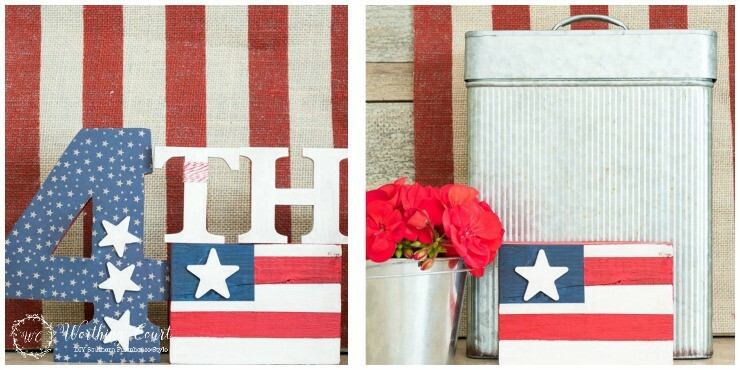 Yeah, fun red, white & blue crafts. Thanks for sharing at the Inspiration Spotlight party. Pinned & shared. See you again soon. Cute idea, Suzy! And I loved that you can mix it up for thePatriotic holidays. I don’t suppose you have a source for that darling metal container in the photo with just the flag?